There are many ways for an intruder to gain access to your home, from simply walking through an open door to garage door hacking devices. 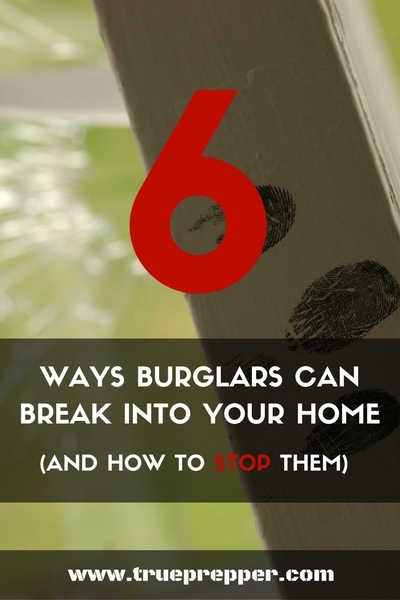 Take a look at six different ways burglars can get in and keep in mind how protected you are against each method. One tricky way thieves can get into your house is by using a wire hanger to pull the emergency release switch on your garage door. To do this, they simply push on the top middle part of your door and fish a hooked wire hanger in to grab the release rope. From there they can pull the handle, which disengages the opener, allowing the door to be pushed up freely. All this can be done extremely fast and it does not draw as much attention as kicking in a door or breaking a window. There are a few workarounds to prevent this. Use a zip tie to ‘lock’ the release so someone would have to quickly cut from inside to disengage the opener. The release is meant to be used in the event of power outage or opener malfunction when you need to exit the garage, so locking with a tie is not a huge risk. The classic move of planting your feet and kicking your heel through a door is a favorite of Hollywood movies. While it is typically harder than the movies make it out to be, it can be done by anyone that knows what they are doing. The trick is to kick right next to the deadbolt, which is typically the weakest part of the door. Driving your heel through the door instead of stopping at the door helps as well. This entry method is common with the military and first responders, including law enforcement and firefighters. Reinforcing a door can be done several different ways, from adding more locks to bolstering the latches. One question you must ask yourself is if it is more likely an intruder or first responder would be using this method to gain entry. If you fortify your front door, it not only limits burglar break-ins but can slow rescue attempts in the event of an emergency. I am definitely not saying to doubt a firefighter’s ability to enter your home- they can almost always find a way. First responders typically have more tools available than an intruder would, and can ram or pry a door open. The trade off is the speed at which they can gain entry, which most find is worth the trade for better home security. Locks can be added, braces put in place, door jambs upgraded- there are several methods to bolster your door and wear a kicker out. Upgrading your door and frame is preferred, since hardware usually doesn’t fail, the wooden door or frame breaks when kicked.Door Armor makes some great upgrade kits that are not an eyesore, but be sure to get the right size for you door and frame. If you don’t get the right size- no big deal, they have free returns. Bump keys are not well known unless you are familiar with lock picking. Bump keys are the “easy mode” of lockpicking, and are generally not preferred by the professionals since they can potentially damage the lock, or may not work at all. Burglars or anyone trying to gain access to your home quickly love them. They can be found through more obscure outlets online, or made fairly quickly with a key blank and a file. Basically, you file deep grooves for each pin in the lock the key is designed for. Once the bump key is made, to use it you put the key in the door and turn it. Obviously, the key is not keyed exactly to the door so this will not open it- but it will apply pressure to the cylinder inside the lock. While applying this pressure with the bump key, you soundly tap the back of the key with a hammer. This causes the pins in the cylinder to ‘jump’, and when they get pushed back down by the springs, they will catch on the edge of the cylinder allowing you to turn the lock. If it doesn’t work the first time, release the pressure on the lock allowing the pins to settle, and then try it again. It usually takes a few tries to pop the lock open. If someone has a bump key to your door lock brand, then they will probably not have a tough time getting in. Schlage and Kwikset locks are prominent in residential areas. Using a different brand lock than others in your area can help, or keeping your lock properly lubed can keep pins from catching on the edge of the cylinder. How old is your garage door opener? When automatic garage door openers first started popping up in the 60s, most of them used the same code to open. Thieves figured that out pretty quickly, bought a couple remotes, and had a heyday. That forced garage door opener manufacturers to start making the dip switch system- a system even some still use today! The openers and remotes on these systems feature 8-12 dip switches, where 8 switches provide 256 possible codes and 12 switches provide 4096 possible codes. That beefed up security a bit, since it would take a burglar a long time to try that many codes on your door. Fast forward to our computer abundant today and that security is virtually non-existent. Computerized devices can send out a wave of all 4096 codes in less than 8 seconds, opening every older garage door within a block. Upgrade your garage door opener if you have a dip switch opener. A would be intruder does not even need to go near your home to open it. Professional burglars have been known to drive around residential areas spamming the codes, seeing which houses are vulnerable and making notes to return later. Upgrading to a newer garage door opener with rolling codes and multiple frequencies is a surefire way to increase your home security. The most common entry method for any home intruder is an unlocked door. Many opportunist thieves go in through completely open doors- not just unlocked doors. Open garages, front doors, windows – all of these are invitations for a quick grab and run which can even go undetected. Unlocked doors are even more prevalent. It just takes one for someone to gain easy access to your home. Whether they try every door before they find the unlocked one, or simply follow you inside- unlocked doors can be a serious security risk regardless of your preparedness level. Unlocked car doors can provide opportunities for thieves, and more than half of people admit to leaving their cars unlocked at home. Some cars are even programmed for or have openers to the garage door. Place reminders to remember to secure your home when you leave and when you arrive. Home automation has come a long way recently, and can help if you have trouble remembering to keep all your entryways secure. What is it with glass and doors? Glass is a nice decorative feature and many doors are adorned with glass panes in the door, or on either side of the door. Unfortunately, glass is very fragile. Any glass near the deadbolt of your door can guarantee you will be glass shopping after a break in. 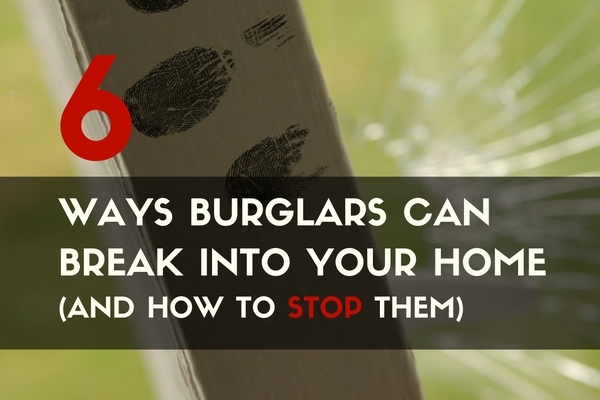 Smashing the glass and turning the deadbolt from the inside is a noisy way to enter a home, but it is a home intrusion favorite. A double cylinder deadbolt can prevent this type of intrusion, since the inside needs a key to unlock the door. These can be a safety hazard during a fire, and many people end up getting lazy and just leaving a key in the inside cylinder anyways. Window security film is another method to thwart this type of intrusion. This security film comes in many sizes and thicknesses and would severely slow an attempt to gain access this way. Let us know any other methods you have heard of that home intruders use to get in. If you have any personal experiences with keeping intruders at bay, leave a comment or give us a like and shout out at our Facebook page. The more we all know, the better prepared we can be. Keep exploring, stay prepared, and be safe. Good point! Another reader pointed out that unlocked second story windows and left out ladders can be an entry point as well. Other than perhaps glass doors I think in most cases windows are the most vulnerable. Windows generally have the least security. It’s quite easy to shatter the glass and once inside you can easily open the door from the inside to exit with the stolen property. These days crooks have gotten more bold with working in small teams doing home invasions while occupants are home. I’ve heard many horror stories of such home invasions. Having a good dog breed to serve as a guard dog is one way of adding security.